The term ‘out-of-home care’ refers to children and young people who are placed in statutory care because they are in need of care and protection for their safety and wellbeing. Children and young people in care have most often received a court order about who takes care of them, and who can make decisions for and about them in the interest of their welfare. Children and young people enter the care system through no fault of their own, and have often experienced high levels of harm and trauma. Children and young people in out-of-home care are placed with either relatives (kinship care), foster carers, adoptive parents (adoption), or they are placed in residential care or independent living arrangements. Children and young people stay in care until they can safely return home or until they turn 18 years. In 2015-16, 162,175 (1 in every 33) children received child protection services. These services range from investigations of allegations of harm, through to care and protection orders and placements in out-of-home care in Australia. As of 30 June 2017, there were 47,915 children and young people living in out-of-home care throughout Australia; an increase of 3% from the year before. This number continues to rise each year. 93% of children and young people in out-of-home care were living in home based care: 38% in foster care, 47% in relative/kinship care, 7% in third party/parental care and 1% in other types of home based care. 85% of children in residential care were aged 10 or over and the median age was 14 years old. 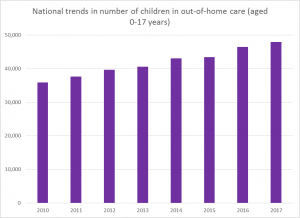 The median age for children being admitted to out-of-home care was six years old; rates of admission were much higher for younger children than teenagers. As at 30 June 2016, there were 17, 664 Aboriginal and Torres Strait Islander children and young people in out-of-home care. 12 X more likely to be in out-of-home care if aged between 5-9 years than their non-Indigenous peers. Where does CREATE fit in the out-of-home care sector? CREATE represents the voices of children and young people in out-of-home care, including foster, kinship and residential care. By ensuring the voices of children and young people are heard and reflected in advocating for change, CREATE aims to make a better life for children and young people in the care system, and better outcomes as they transition to independence. The demand for out-of-home care is ever increasing with the number of children and young people in care doubling in the last decade and increasing every year in all States and Territories across Australia. Statutory child protection services are the responsibility of State and Territory governments that often work in partnership with non-government organisations to provide the direct care services to vulnerable children and young people who are suspected of being abused, neglected or harmed, or whose parents are unable to provide adequate care or protection. Across Australia, more and more out-of-home care services are delivered by government-funded community organisations. CREATE believes children and young people in out-of-home care have the best insight into how the child protection system works and their experiences within the care system provide the best source of information for improving the system. Engaging government and non-government agencies in hearing and responding to the voices of children and young people. Through our Young Consultant training and youth advisory structure, children and young people are assisted to advocate on their own behalf and to train workers and carers about the on-going needs of children and young people in care. Children and young people in out-of-home care have the right to be safe from harm; they need to have their care and developmental needs met and to be provided with the same life opportunities as other children and young people. They need safe, stable and supportive living environments whilst work is conducted by child protection agencies to support their return home. Young people nearing adulthood often require support to stay engaged in education and employment, connect with family and community, and prepare for the transition to independent living. CREATE supports children and young people in out-of-home care by listening to what they have to say and by helping them inform governments and other organisations about their experiences in care to help improve the child protection system.